While a Europa lander mission is not yet approved by NASA, the agency’s Planetary Science Division has funding in Fiscal Year 2017 to conduct the announcement of opportunity process. The community announcement provides advance notice of NASA’s plan to hold a competition for instrument investigations for a potential Europa lander mission. Proposed investigations will be evaluated and selected through a two-step competitive process to fund development of a variety of relevant instruments and then to ensure the instruments are compatible with the mission concept. Approximately 10 proposals may be selected to proceed into a competitive Phase A. The Phase A concept study will be limited to approximately 12 months with a $1.5 million budget per investigation. At the conclusion of these studies, NASA may select some of these concepts to complete Phase A and subsequent mission phases. In early 2016, in response to a congressional directive, NASA’s Planetary Science Division began a study to assess the science and engineering design of a future Europa lander mission. NASA routinely conducts such studies – known as Science Definition Team (SDT) reports – long before the start of any mission to gain an understanding of the challenges, feasibility and science value of the potential mission. The 21-member team began work almost one year ago, submitting a report to NASA on Feb. 7. The agency briefed the community on the Europa Lander SDT study at recent town halls at the 2017 Lunar and Planetary Science Conference (LPSC) at The Woodlands, Texas, and the Astrobiology Science Conference (AbSciCon) in Mesa, Arizona. The proposed Europa lander is separate from and would follow its predecessor – the Europa Clipper multiple flyby mission – which now is in preliminary design phase and planned for launch in the early 2020s. Arriving in the Jupiter system after a journey of several years, the spacecraft would orbit the planet about every two weeks, providing opportunities for 40 to 45 flybys in the prime mission. 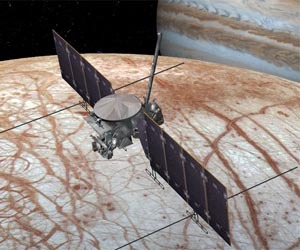 The Clipper spacecraft would image Europa’s icy surface at high resolution, and investigate its composition and structure of its interior and icy shell. Wednesday’s community announcement in no way obligates NASA to solicit future proposals.